The Kitchen at the End of the World is set in an empty hotel on the edge of the Great Vastness, the unchartered lands beyond the stretch of marionettes' strings. On a snowy evening, a poet, a mathematician and a musician find out that there is only one original song left before all the combinations of musical notes and words have been used up. The same night, a penniless traveller is smuggled into the hotel kitchen and the almost forgotten secrets at the edge of the world begin to emerge. 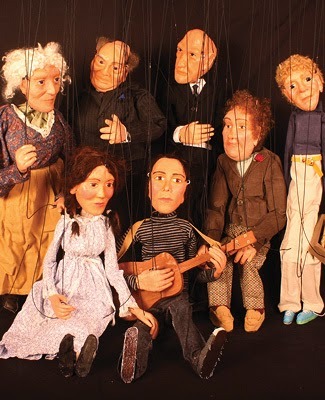 This magical marionette show brought tears to the eyes of sell-out audiences at the Greytown Arts Festival in 2012, and is set to premiere at Circa on January 16. Stage manager, Anke Szczepanski, interviews writer and puppeteer William Connor about the play and its origins. AS: How did the “Kitchen” script come about? WC: The script for the play has been in my creative subconscious for years now. I had this idea of a poet, a mathematician and a musician meeting in an empty hotel and working out that there is only one final original combination of musical notes and words before the reservoirs of collective creativity have been exhausted. Another image in my head was of this song being performed in front of crowds on a stage as a dramatic comic apocalypse! I told my partner Steffen about the idea and we planned it as an illustrated children's storybook. After working with marionettes during his Masters degree, I decided that the concept would suit marionette theatre beautifully and this gave me the impetus to write the play. AS: What / who inspired you? WC: Because this play has been hanging around in my head for ages, it has had a lot of time to steep and gather flavours of other works. I was inspired by Ronnie Burkett's “Ten Days on Earth”, particularly his harnessing of marionettes to tell sad and sometimes dark stories. Other than this, I think the play takes place in a surreal place somewhere between Samuel Beckett and C.S.Lewis! AS: How does it feel to puppeteer your own script? WC: The line learning and puppeteering processes are just like for any other play. Since completing the final edit, I have completely lost any sense of authority or ownership over the script and feel I guess like a parent does when their child grows up and starts their own independent life. The lines have a distinct family resemblance to the thoughts in my head, but I have to give it space to live and grow and be cut up by my fellow director and puppeteers! AS: Who’s your favourite character as a writer and as a puppeteer? WC: As a writer, I am really fascinated by Cook, the wise gentle matriarch of the Hotel at the End of the World. In the latest rewrite, she has gained more dimensions and a vulnerability that has made her a really compelling character for me. As a puppeteer, James, the traveller and narrator is my favourite! He is a beautifully made marionette - I really feel him and love the transfixing way his face can express sadness and hope just with the gentlest tilt of the control. Puppetry is such a strange and thrilling art! I never get tired of these two characters! The Kitchen at the End of the World opens on Friday, 16 January and runs until 25 January. There is a $20 Preview on Thursday, 15 January. Tickets are booking quickly for all performances, book now! Visit www.circa.co.nz or call 801-7992.